Breakfast included, TV, Fan, All round mosquito net, wardrobe, table top, sofa set, extra bed or baby cot provided on request, bathroom and toilet, balcony, mineral water, chocolates. Set in a quiet and safe neighbourhood with ample secure parking, Our Hotel offers affordable accommodation, dining and conference facilities to its guests. 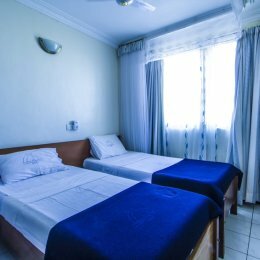 The hotel is located in Miritini, Mombasa. It is approximately 8km from the Mombasa-Nairobi Highway, behind the Vehicle Inspection Centre offices, and 7km from the Moi International Airport. Enjoy warm hospitality and sumptuous meals from the restaurant, which serves a wide variety of meals to suit your taste buds. The hotel’s menu options range from buffet to a-la- carte. It offers free breakfast to guests. A team of highly trained staff is always available to guide you through the day’s specials and serve you with a smile.